THE COSIMO CODE FORUM • View topic - WELCOME ABOARD! On behalf of John Broven, Sir Shambling and myself, I'd like to welcome you here to the Cosimo Code Forum. We view the project as ongoing, and hope to be able to fill in some of the gaps in the Code with your help. Post subject: Re: WELCOME ABOARD! I would like to thank you guys for all the work that you are putting into this. As you probably already know, if I had to make a choice on only hearing one sub genre of soul music, NOLA would be it. I look forward to reading about the players etc, as my knowledge of that is limited. Again, thanx and I look forward to reading what is on offer. Guys - I couldn't be happier. NOLA is my first love and the music that was made at the three Cosimo studios is at the very top of that pile. Can I ask why the date starts at 1960 rather than from when J&M opened? If my totally impatient opening question has already been posted then I apologise. Am a bit refreshed at the mo. I'll come back later. The focus of this project is, at present, the 45s that bear the "Code" - which, for whatever reason, was not instituted by Cosimo until October of 1960. It's not that we don't LOVE and appreciate the earlier J&M and Cosimo Studio recordings - we most certainly do , and maybe we'll add pages on that period down the line... for now, though, we're sticking with the Code era! Cheers Red. (From one 'red' to another! - I also play NOLA piano in a duet called Two Piano Reds). If I had taken the time to read the site before shouting "1960?" I would have spared myself the embarrassment. So pleased to have the experts all gathered together. I've arranged holidays around the works of John Broven - so great to have you here sir! I really do hope that you guys can move back to the early days at a future date. The chronology of J&M would be fascinating and would make for a great CD series. I agree - the early period deserves to be examined more fully as well. 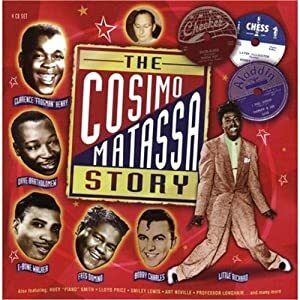 As far as a CD series, not sure if you already have it, but THE COSIMO MATASSA STORY 4 CD box on Proper Records is a fairly comprehensive overview of the earlier recordings. Yeah man, I got both them and the two Heavy Sugar. These OOC CD collections are great for music collectors (I'm not that bothered about owning the vinyl sorry). Have you invited Nick Duckett the compiler of these CDs? Love to have Nick aboard... but I don't know him. I have that 4 CD comp too as I was also at Jazzfest 96. According to some, that set is now worth many bucks. I've emailed Nick and told him about this site.